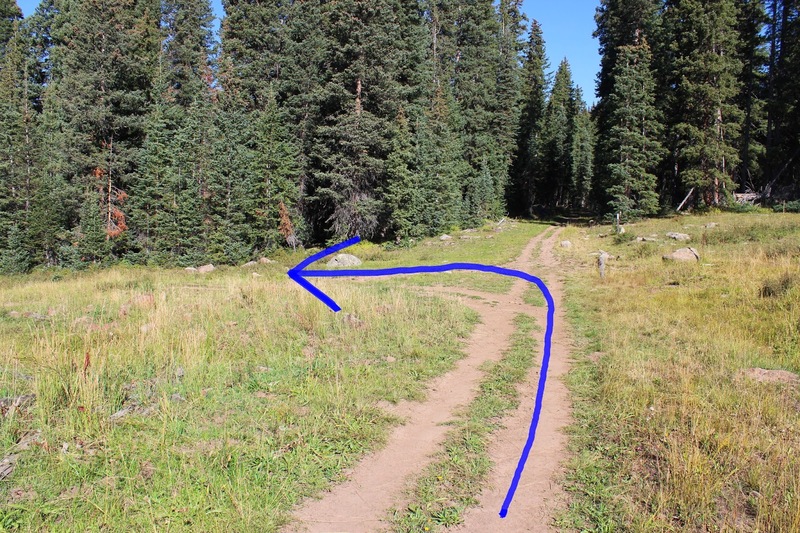 The Eureka trail is located in the Grand Mesa National Forest east of Grand Junction, Colorado but closer to Cedaredge. The trail stretches between the Surface Creek Road and Green Mountain trail passing several reservoirs enroute. The Eureka trail covers a large area that is forested almost exclusively with conifer trees that fill the air with the thick aroma of pine. 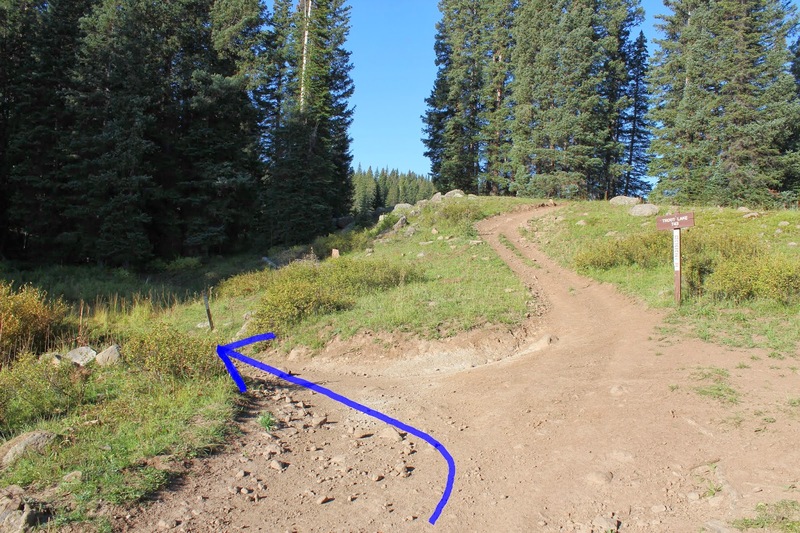 This post starts at the eastern trailhead off of Surface Creek Road. Google Maps may mess up the directions and try to send you on the Old Grand Mesa Road which makes it twice as far to get here. The best route is to find your way to the Grand Mesa Visitor Center on Highway 65 and turn east. 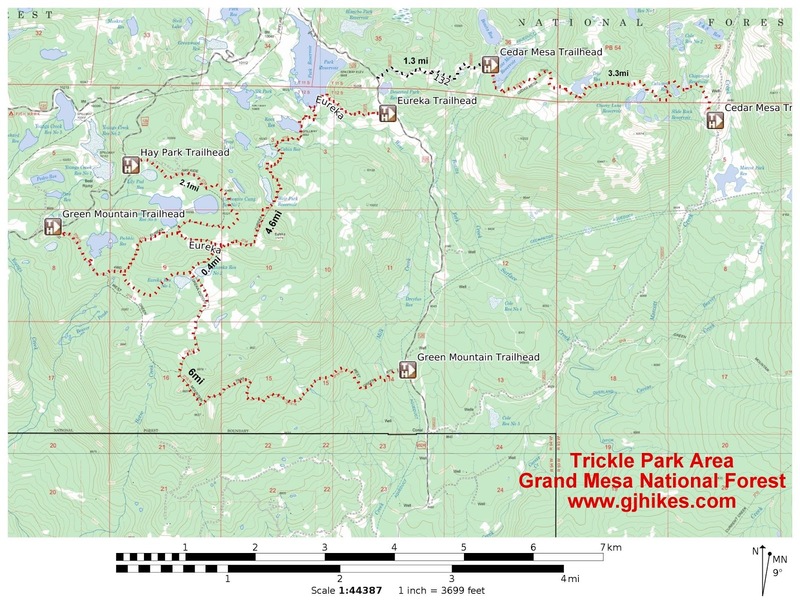 The road starts out as the Baron Lake Road but becomes the Trickle Park Road as you drive. Its official designation is FDR #121. Follow it for about 7.8 miles and turn right onto FDR #125 which is the Surface Creek Road. Continue for 1.7 miles, passing Trickle Park Reservoir, and turn right onto FDR #125.1A. This is the Cabin Park Road but there probably aren't any signs that say that. This post begins at this point. At one time you could drive in on the Cabin Park Road, cross the dam, and park right at the trailhead on the other side of the lake. A couple of large boulders have been placed on the dam to restrict traffic down to ATV's and side-by-sides. Parking back at the Surface Creek Road adds 2 miles to the round trip distance for this hike. It is possible to park near this side of the dam, if the road is in good shape, and cut a lot of that distance off. The Eureka trail officially begins on the west side of the Trickle Park Dam. Most of the trail is pretty smooth but there are a few rough rocky sections. Especially on some of the hills. About 1.3 miles from where we started out the trail crosses the Knox Reservoir Dam. These reservoirs were all built by local area farmers and ranchers. Most of them are named after the people that built them and many of them were built before the area was ever designated a National Forest. The ranchers bore all of the expense and it didn't cost taxpayers a penny. Some of the reservoirs, like Knox, get drained down pretty quickly to supply irrigation water while others, that are usually larger, are stocked with fish and efforts are made to keep enough water in them, when possible, for a viable fishery. At 1.7 miles the trail passes below another reservoir dam. At this point the trail to Trout Lake departs on the right. This is one of the rocky sections of trail. There are quite a few places where the trees are thick enough that not a lot of sunshine makes it through to the trail. The biggest hill comes up after passing the Weir Park Reservoir. Every once in awhile there are places where you can get a more distant view of your surroundings. Right around 3.3 miles the Eureka Cutoff trail breaks off on the left taking a shortcut down to the Green Mountain trail. It is time once again to play peek-a-boo with some deer. 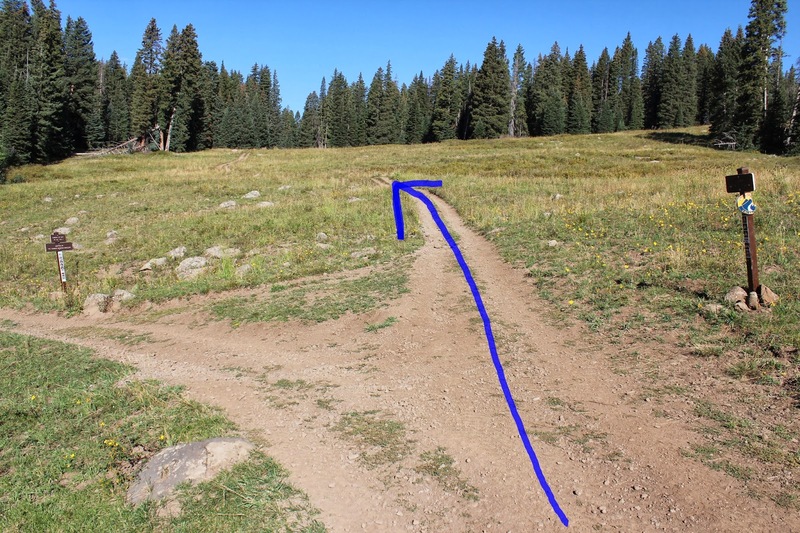 At 4 miles the trail comes to Carbonate Camp Reservoir #6 where it makes a sharp turn to the left. This is a shot of Carbonate Camp #6. It can't be seen all that well from the trail. Places like this make the Eureka trail a good candidate for a backpacking trip. It is only about another 6 tenths of a mile from Carbonate down to the Green Mountain trail where we turn around. From personal experience we can say that fishing can be pretty good at times at the Trickle Park Reservoir. This is the Trickle Park Cabin. It belongs to the Grand Mesa Water Users Association. They have a nice sign that says 'Welcome to our Neck of the Woods' but the cabin itself is private property. 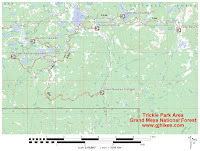 There are several other trails in the area that we would like to hike and post when the opportunity arises. Primitive campsites can be found all along the roads in the area. All primitive campsites are free. You just have to get there before anyone else. 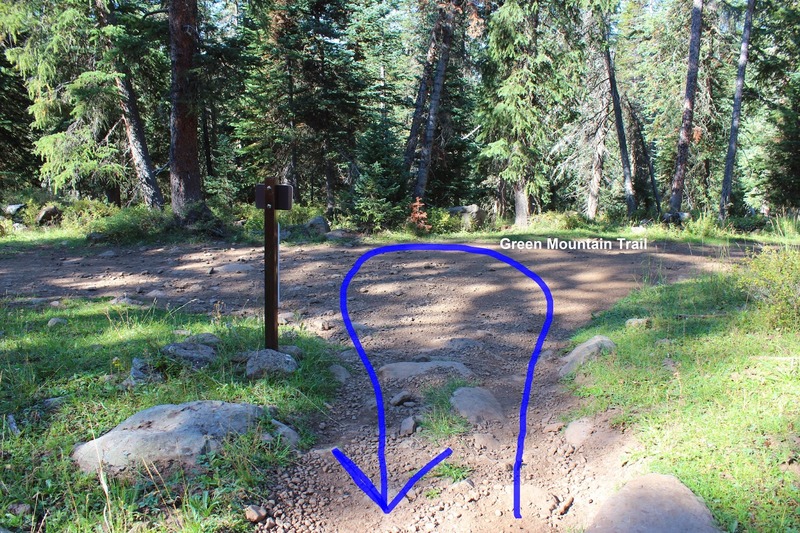 This trailhead is only 13 miles from Cedaredge for anyone coming from that direction or if you would like to see some different country you can drive home that way. The Eureka trail has a lot for hikers and other to like. If you would like to see it for yourself then all you have to do is 'Take a hike'.